Description: Hitomi Kanzaki is a typical highschool girl. One thing that makes her different from any other people is ? that she can read fortunes with tarot card ? very well. Everything starts as she is encountered a mysterious swordsman from another dimension called Gaea, and then transported into that world. Van Fanel is the name of the swordsman. The day he becomes the king of Fanelia, many invisible giants invade his homeland. With his robot-like mecha, Escaflowne, and Hitomi's ability to foretell the future, the journey to save the Gaea starts. Incredible series! I can't say enough of it. I was so surprised when I found out that this was made for TV series. The quality of the art, music, voice, and every other things are so beautifully done. Reason why this is so good? The music is one thing that everyone notices. Kanno Yooko san did the music for this exquisite series, and I highly recommend you the soundtracks. There are 5 soundtracks, including the beautiful collection "Lovers only." Overall, the music is classical and operatic, but no matter what kind of music you listen to, the music to this series is as beautiful as field of flowers. You will never regret buying them. The Vision of Escaflowne is definitely one of the best animated TV series I've ever seen. The graphics are great; the story is great; the action is great; the music is great?well, you get the idea. It has everything you would want in a good anime. It is also a very captivating anime. Once I started watching it, I couldn't stop it. Every episode leaves you at a cliffhanger, and you just have to go on watching it. And trust me, there is no one episode that will disappoint you. The character designs may feel a little weird when you first watch it. Eventually, you will get used to their pointy noses and the halo that's always on their heads regardless of the lighting conditions. The only thing that I would really complain about in this anime is Hitomi. To be honest, I don't like her. (Yeah, now all Hitomi fans are all going to gang up on me?) On Earth in her own ordinary life, she likes her Amano-sempai. After she met Allen on Gaea, her feelings turn towards him. Then later on, somehow all of a sudden she's in love with Van. I have no idea what happened. Can't this girl make up her mind? The designs of the Guymelefs are amazing. I'm totally awed by the Escaflowne. When I saw it fight for the first time, I was already in love with it. Then when I saw it turned into a flying dragon, I was like, "Woo baby!" It was just TOO COOL!!!! So, after all this talk, what am I trying to say here? The Vision of Escaflowne is one of those things that you would HAVE TO see. Trust me, you won't regret it. 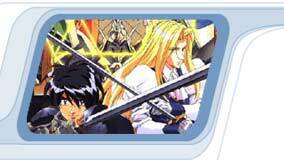 The Vision of Escaflowne is an epic fantasy adventure. It is wonderfully animated, with great color and imagery, showing the master hand of Shoji Kawamori (Macross Plus). The score by renowned composer Yakko Kanno is marvelous and memorable. The voices, especially the clear, vibrant voice of young singer Maaya Sakamoto, who plays the main character Hitomi and sings the title song, are nearly perfect. Most important, it has a great, fresh and original, masterfully paced story. Almost every one of the 26 episodes delivers a fresh surprise, but a surprise that fits, not one that adds pointless complexity. The protagonist, 15-year-old schoolgirl Hitomi Kanzaki, is appealing and sympathetic. Transported into the mysterious world of Gaea, she finds her knack for fortune-telling blossom into a formidable second sight. She copes with deadly and terrifying situations, tries to do the right thing, summons up courage when she needs it, and falls in love a little too easily (well, she is 15). In Gaea, dragons fly, beast-people live, and wars are fought with giant robot-suits. A conflict is unfolding between the independent kingdoms and the empire of Zaibach, which has its own mysterious agenda, involving a machine to alter destiny and the lost power of Atlantis. I give The Vision of Escaflowne my highest recommendation.